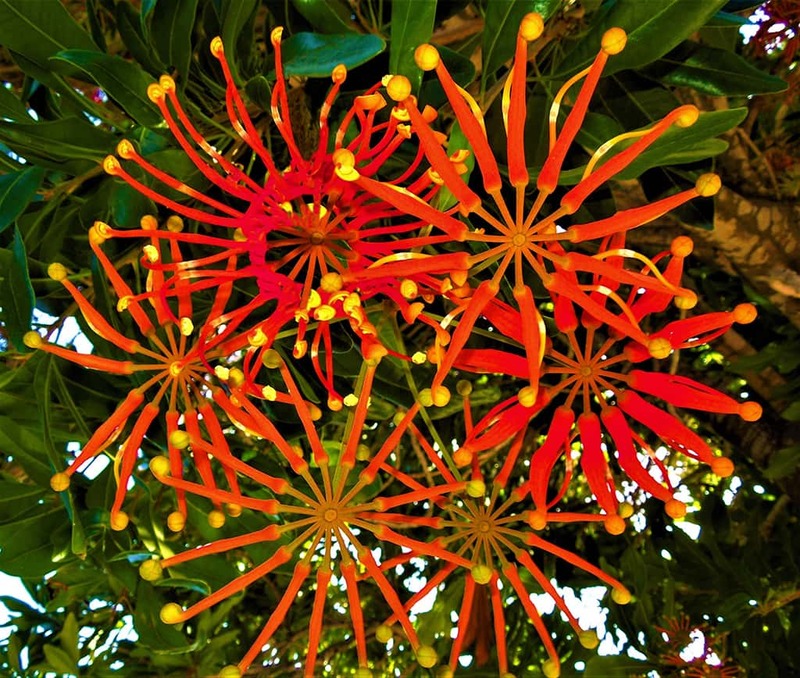 “Fire-wheel Tree” may seem like a strange name for a tree, until you see its fiery-red, circular-shaped, flower clusters (called umbels), which look like flaming bicycle wheels! 3-inch long flowers are the “spokes” of each wheel (6 to 20 flowers per umbel); these radiate out from the umbel’s central “hub” and bear at their ends (at the “rim”) globular yellow tips where the floral organs are located. The flowering time is usually in autumn, but can occur sporadically at other times of the year. The nectar is wonderfully sweet – attracting hungry moths for pollination. 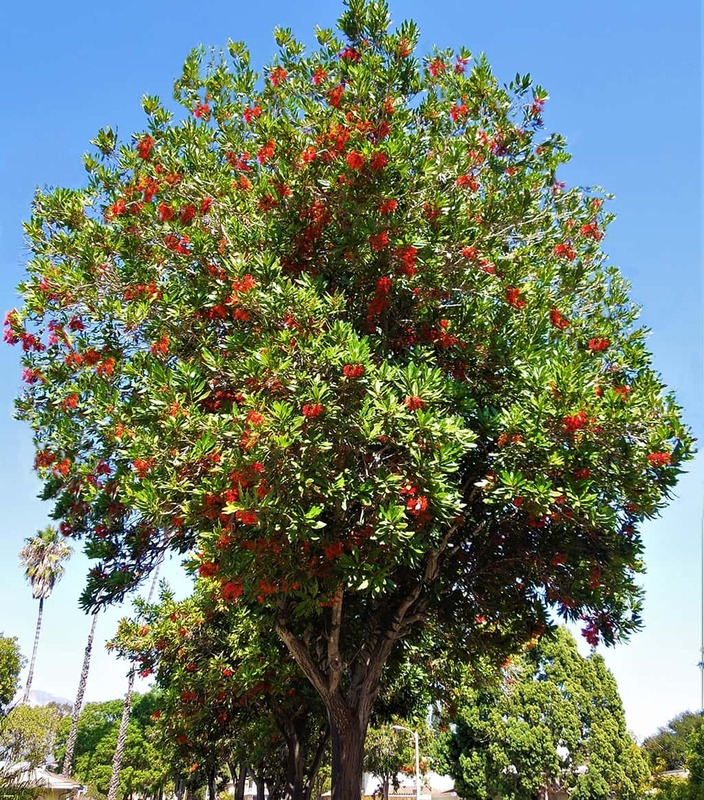 In addition to its interesting flowers, the Fire-wheel Tree has many other attributes that make it a desirable ornamental tree in the Santa Barbara area. It has upright-growing branches, spreads only 15 to 20 feet wide, reaches only about 25 to 30 feet tall, and is usually slow-growing in our climate, so it is a good tree for landscape areas where restricted size is a plus. Its lustrous, shiny, dark-green leaves make a lovely backdrop for the bright-red flower clusters. These attractive leaves have wavy margins, range from 6 to 15 inches in length, and are deeply lobed when trees are young, rather like oak leaves. The smooth to shallowly-furrowed bark is gray to brownish-gray, a striking contrast to the foliage. It’s no surprise that the Fire-wheel Tree is in the Protea plant family, the members of which are known for bearing rather bizarre looking flowers. It is native to the subtropical and tropical rain forests of eastern Australia, where it can reach heights of 100 feet. Its botanical name is Stenocarpus sinuatus. The genus name comes from the Greek word “stenos”, meaning “narrow”, and “karpos”, meaning “fruit”, and refers to the narrow, 2-4 inch long, boat-shaped, seed pods which contain dozens of winged seeds. The specific epithet comes from the Latin “sinuatus”, meaning “wavy”, referring to the undulating leaf edges. Due to its tropical origins, it does better in deep, well-drainage, soils and with periodic watering during the dry season. In spite of that, it grows quite well in a variety of soils and in our Mediterranean climate, tolerating temperatures down to 25 degrees. It likes full sun to partial shade and requires little maintenance. As with other plants in the Protea family, be careful when fertilizing to avoid using phosphorous, which can cause leaf yellowing and dieback. With very little care, the Fire-wheel Tree makes a lovely small- to medium-sized tree for residential and commercial landscapes. Fire-wheel Trees have been planted extensively as street trees in Santa Barbara. They can be seen in the 100 to 300 blocks of West Arrellaga Street, in the 100 and 200 blocks of West Micheltorena Street, in the 300 to 500 blocks of East Padre Street, in the 900 to 1000 Blocks of East Ortega Street, intermittently in the 100 to 800 blocks of East Haley Street, Grand Avenue, and on Casiano Drive and Venitia Lane.